Hemel Town’s clash with high-flying Sutton United tomorrow is a ‘free game’ for the Tudors, according to manager Dean Brennan. The Tudors go into the match on the back of five games without a win, while Sutton have won eight of their last 10 National League South fixtures. But Brennan believes this could play into his side’s favour, as all of the pressure is on their in-form visitors. “Sutton is a free game for us because there’s no pressure on us,” he said. “Any result will do us, apart from a defeat, and we would take a draw now. “I’ve never really said that before, and we will obviously go out there and try and win the game but it’s a free game for us. Whatever we get out of it is a bonus. We will obviously go out there and try and win the game but it’s a free game for us. Whatever we get out of it is a bonus. 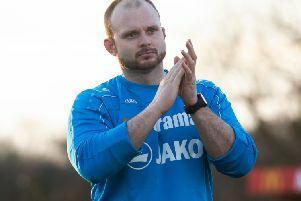 Despite promising a cavalier approach to the game, Brennan is wary of the threat posed by a Sutton team who Hemel have already faced three times this season – drawing twice and losing once. “Sutton have got good strength in depth in their squad and we know it is going to be a tough test, but games between Sutton and us are always fantastic games,” said the Tudors boss. “There’s always drama and excitement. “We’ve got to be able to deal with their physicality – if we don’t deal with that, we won’t get anything from the game, it’s that simple. They are a very, very good side. “They’ve got a lot of class in their team and the boy Fitchett is a player I love, even though he always scores against us! “But they’ve got frailties as well, and we will look to expose their weaknesses. We’ve got to stand up, man for man, and make sure we deal with what they have. “When we played them in the three games earlier in the season I didn’t think there was much in any of the games. “I thought our 1-1 draw with them at home in the FA Cup was arguably our best performance of the season, and James Potton was outstanding on the day. Hemel will be looking to bounce back to form tomorrow, and Brennan added: “We’ve had a difficult spell of late but it’s like I always say, the harder you work the luckier you get and that’s the way it works.